This paper is a gem. What did they do? They fed rats chow or they fed them on one of four other diets enriched in PUFA. The extra PUFA were based around various mixtures of linoleic acid with alpha-linolenic acid, some were mostly corn oil, some were slanted towards varnish (flax/linseed oil). Total 18-C PUFA made up 9.4% of calories, ie was obesogenic, and this was identical for all of the high fat diets. Overall macros were identical in all of the high fat diets too. There was no sucrose. The rats were fed ad lib. Here is the link to Table 1 which lists the compositions, it's too big for putting it up as a jpeg. Just look at how utterly fair the composition of the high fat diets were. Even if the absolute amount of linoleic acid in the lard is not accurate, there will be a consistent error across the diets and the results stay plausible. My only complaint is that there was no group where the omega-3 lipids predominated in the diet PUFA, a 50:50 mix was the maximum. Whereas the maximum omega-6 fed group got essentially all of their PUFA from omega-6 PUFA. The second excellent feature is that the rats were neither semi-starved nor forcibly overfed. Rats are not people. They cannot be verbally asked to overeat to maintain a stable bodyweight nor to calorie restrict to lose weight. They will simply eat until they are no longer feeling hungry. If that happens while they are svelte or not until they are morbidly obese, the rats don't care. 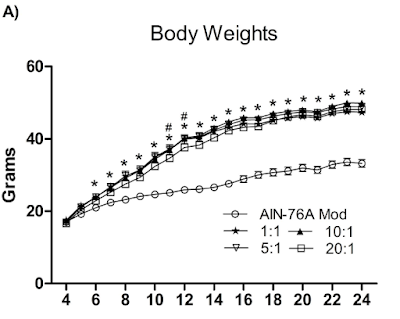 Can you see that the open squares group gain weight slightly more slowly than the other PUFA diet groups? This shows between week six and week 17. The two hashtags mark out a couple of time points where this achieved statistical significance. This slightly less obese group of rats is the group which ate the least alpha-linolenic acid, the most linoleic acid. 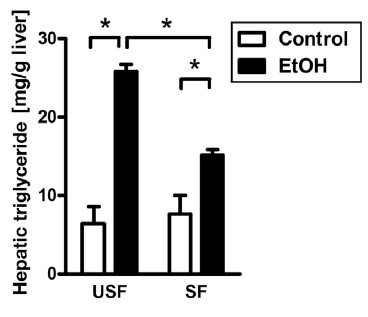 This suggests that omega-6 PUFA are less fattening than omega-3 PUFA. I like that. Protons likes that. The effect was fairly small and only shows as an early facilitation of weight gain. 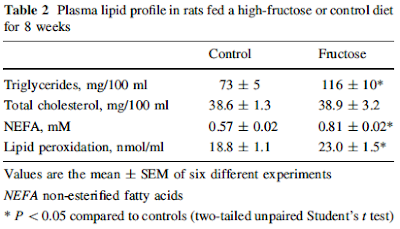 By the end of the study the rats and their adipocytes were all about as fat as they were going to get on 9.4% of calories from any family of PUFA. You can easily hide this effect by under feeding (pair feeding to the same calories as a chow fed group or arbitrarily reducing overall caloric availability) or overfeeding (paid humans or intragastric cannula over-fed rats). If you are an omega-3 lover this can be necessary. But, given a decent study, it shows. Consuming the 18-C omega-3 rich linseed oil/flax oil/varnish may not make you terribly much fatter than corn oil will eventually make you, but it should get you there quicker. The situation for EPA and DHA is different. Oxidising these will increase the cytoplasmic NADH:NAD+ ratio via peroxisomal oxidation (bad) and give reasonable mitochondrial function from oxidising the residual saturated caprylic acid C-8 (good), which is the normal fate of very long chain fatty acids of any ilk. Executive summary: Omega-3 18-C fatty acids are more obesogenic than omega-6 18-C fatty acids. The effect is small but real, it might show better if all of the PUFA were alpha-linolenic acid rather than to 50:50 mixture used. It still makes me happy. I consider that the mitochondrial oxidation of PUFA will always show as increased peak insulin sensitivity. The cost of that increased insulin sensitivity is fat gain. The fat gain eventually eliminates any benefit from the initial increase in insulin sensitivity. Forced manipulations of the food intake downwards will preserve the intrinsic insulin sensitivity at the cost of chronic hunger. So when high PUFA-fed lab-rats are "pair fed with the chow group" the PUFA rats will look really good, metabolically. The converse, encouragement to overeat, based on avoiding "accidental" weight loss (weight loss is a huge confounder in studies of hepatic lipid accumulation from almost any intervention, PUFA included) by weekly weighing to maintain weight will mask any benefits from saturated fat induced adipocyte insulin resistance. Stacking the deck is crucial to the result you want to get. Again, it is a pro-saturated fat paper, always nice to read. They did some odd things such as using fully hydrogenated soya oil, mostly stearic and palmitic acids, versus corn oil and their feeding protocol used controlled intragastric feeding, with or without ethanol. Obviously there is no fructose in any of the feeds. USF diet supplies 35% of calories from corn oil (which is roughly 60% linoleic acid, ie 20% of total calories as PUFA) and there is no lipid accumulation at all without ethanol. PUFA alone to not appear to cause fatty liver. Adding ethanol produces spectacular steatosis (top right). 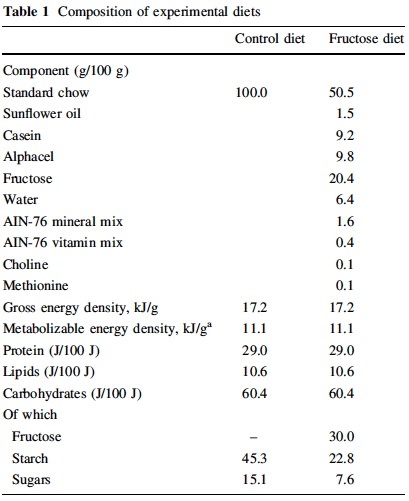 The SF diet also included 5% of calories as corn oil which, combined with ethanol, does produce some steatosis (bottom right). My feeling is that fructose is going to behave in exactly the same way as alcohol, through a very similar process. If that is correct then saturated fat will protect your liver from peroxidation. I'd not suggest that fructose won't cause problems, it might even generate steatosis and hepatic insulin resistance, just conversion of that steatosis to NASH seems very unlikely without the PUFA. The fructose fed rats carried 18g of extra fat, just over 12g of which were in mesentery and the epididymal fat pads. Visceral fat. The fructose fed subcutaneous adipocytes had an average volume of 25,200μm3 vs 40,950μm3 in the controls. The situation is reversed in the visceral adipocytes, fructose fed are 28,540μm3 vs 19,870μm3 in the controls. Those elevated FFAs along with elevated fasting triglycerides are both suggesting routes in to and out from the liver respectively. I also rather like the elevated lipid peroxidation, this is not happening to palmitate! 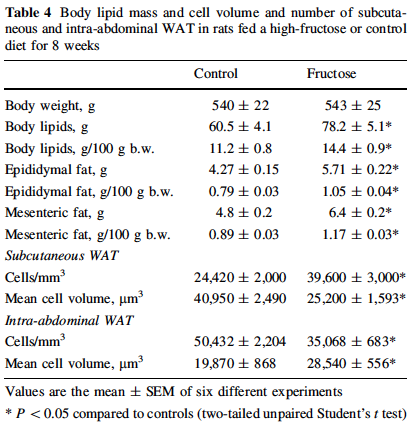 So it's all very suggestive that fructose might be working on subcutaneous adipocytes much the way that alcohol does. I suppose it could be acting on all adipocytes, subcutaneous and visceral, just the repackaged FFAs are targeted to visceral adipocytes, hence the overall shift in size differential. Just as neat vodka makes you thin so a very high fructose diet should do the same. Adding in more starch and/or glucose should go more towards the beer belly look. Of course you could just argue that fructose or ethanol simply generated lipid in the liver which was shipped out destined for visceral adipocytes. Until you look at the alcohol tracer study and realise that it is certainly not that simple for ethanol. I just have to wish that someone had done a similar tracer study on fructose feeding. Can't have everything I guess. Registered Dietitian Health Educators: how fat do you want to get? "The intervention involved 22 instructional sessions held over 12 months in diet-specific groups of approximately 17 participants per class. Sessions were held weekly for 8 weeks, then every 2 weeks for 2 months, then every 3 weeks until the sixth month, and monthly thereafter. Classes were led by 5 registered dietitian health educators who each taught 1 healthy low-fat class and 1 healthy low-carbohydrate class per cohort"
"...an emphasis on high-quality foods and beverages"
"...focus on whole foods that were minimally processed, nutrient dense, and prepared at home whenever possible." This should be a good intervention. "Then individuals slowly added fats or carbohydrates back to their diets in increments of 5 to 15 g/d per week until they reached the lowest level of intake they believed could be maintained indefinitely"
End result of this is that 10% of the participants weighed more at the end of 12 months of closely supervised healthy eating by a Registered Dietitian Health Educator than they did at the start. Cracking intervention for these poor folks. And in both the low fat and the low carb groups just under 5% (LF 4.3%, LC 3.6%) of participants developed metabolic syndrome, who had been relatively healthy before the start of the intervention. How can you manage this with "healthy" food and 22 meetings with a Registered Dietitian Health Educator? I'm impressed. If a Registered Dietitian Health Educator ever comes your way, RUN. Especially if they use the words "healthy" and "diet" in the same sentence. Bottom line: Low carb diets only work when you limit the amount of carbs you eat. However "healthy" those carbs you add back in might be, depending on the opinion of a Registered Dietitian Health Educator, it's no longer a low carb diet. You'll get fat again. Of course the same applies to low fat diets, especially if they are sugar restricted at the same time. Ultimately if you follow a low fat diet with as much added fat as you feel comfortable with, you're going to be disappointed with the results too. Adding back sugar will be even more disastrous. Sad but true. Addendum: Gardner did essentially the same study in 2007 but made the mistake of publishing the weights alongside the carb intakes at each assessment interval. I wrote all over his graphs here. He didn't repeat the mistake. No one should imagine he's stupid. Or honest. TLDR: Be cautious of anyone who tells you fructose metabolism is limited to the liver. Fructose uptake by the liver is saturable. 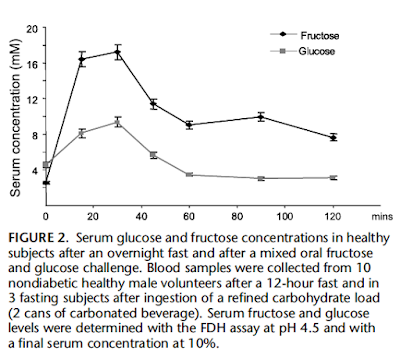 Drinking two cans of soda sweetened with high fructose corn syrup produces a peak plasma concentration 17mmol/l. Yes, 17mmol/l. On average. "In 3 of these subjects, intravenous access was obtained in an antecubital vein, and additional blood samples were taken at baseline and 15, 30, 45, 60, 90, and 120 minutes after ingestion (93 minutes) of two 75-mL cans of a proprietary soda, for determination of serum glucose and fructose concentration. Each 40-oz can of soda contained 75 g of high-fructose corn syrup, which consisted of 55% fructose and 45% glucose as constituent monosaccharides, equating to 41.25 g fructose and 33.75 g glucose, respectively". Go figure. Two 40oz cans of soda? Some big cans there, even by USA standards! This next group seems to have managed to write an interpretable methods section but missed peak fructose levels by only sampling at 60 and 120 minutes. 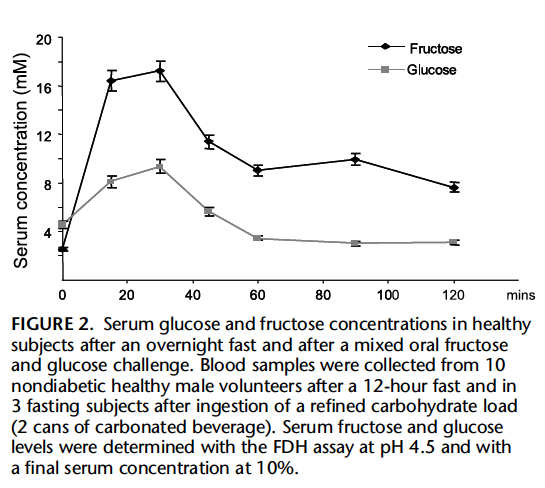 Ingesting 75g of neat fructose, as a solution, gives a blood concentration of 130mg/dl, ie they measured just over 7.0mmol/l in real units, at one hour post ingestion. So fructose gets past the liver and will be taken up by any cells with GLUT3s on their surface. Whole body. What do adipocytes do with fructose? They don't oxidise much of it. They don't convert much to lactate. They do convert most of it to palmitate and a little to oleate. They release the palmitate as FFAs. 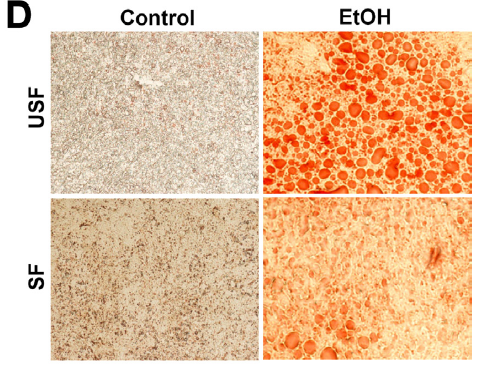 You can't tell from the study how much this palmitate raises systemic FFAs because the study was being performed on "adipocyte-like" cells in cell culture. But, assuming that in most cases fructose would be co-ingested with glucose, you have here the classical situation of elevated free fatty acids, in combination with elevated glucose, in combination with elevated insulin. This is my definition of metabolic syndrome. The hyperinsulinaemia will, until you become diabetic, eventually control the hyperglycaemia. It may well suppress the elevated FFAs. The glucose and FFAs will be pushed* in to any cell which will respond to insulin. *Nothing is actually "pushed". Insulin facilitates diffusion (GLUT4s) and maintains a diffusion gradient by removing glucose to glycogen and FFAs to triglycerides. The liver will be right in the frontline for accepting these FFAs, which should be in adipocytes, and experiencing sustained high levels of insulin (to control glycaemia) will make the hepatocytes hang on to those fatty acids. This is in addition to any intrahepatic trigycerides from fructose-driven DNL. Overall we end up with massively calorically overloaded liver cells. This is the prerequisite to hepatic steatosis and all that is then needed for the generation of inflammatory changes is a source of omega six PUFA. There is a desperate need for liver to say "no" to any more calories. It does by resisting insulin. Which it does by generating ROS. If those ROS meet linoleic acid, it's welcome to 13-HODE, 4-NHE and any other peroxide you care to dig up. These PUFA derivatives do cause insulin resistance per se (as well as 13-HODE stimulating cancer growth), but to me they are just an amplification system derived from what is already happening at the "front end" of the mitochondria... ROS generation by RET, essential to limit grossly excessive caloric ingress. Saturated fat and fatty liver. Payday in Colorado. "Overall, these data suggest that diets enriched in saturated fatty acids are associated with liver inflammation, ER stress and injury". 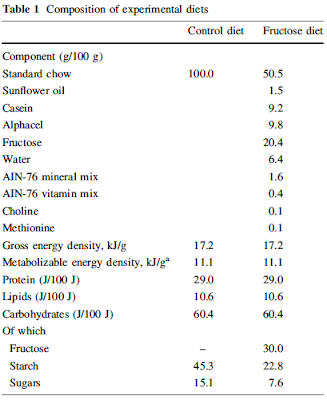 I would agree that the stearic acid rats stayed comparable in weight to others despite eating more calories than either Crapinabag or PUFA fed rats, as in Table 1. There is NO evidence that they developed inflammatory changes in their liver! They had a statistically significant increase in messenger RNA expression for seven genes associated with inflammatory liver disease. The question is whether these mRNA changes actually result in detectable inflammatory changes in the liver, or are they markers of the normal response to reverse electron transport though complex I derived superoxide which might also trigger life extending increases in SOD and/or catalase gene expression? ROS generation is essential to mitochondrial biogenesis. It MUST affect signalling molecules. At what level does physiological signalling degenerate in to pathology? Easy to find this out, just look at the liver histology. What we need to know is whether there is histological evidence of NASH development. After all, we know from the methods that they took terminal samples of liver and snap froze them in liquid nitrogen. Either sticking some in formalin at the same time or getting histology done on the frozen samples (not ideal from the histologist point of view but quite possible) would allow them to correlate their mRNAs with actual damage in the liver. They didn’t do this. “Liver tissue was homogenized in buffer (100mM Tris, pH 7.8) and alanine aminotransferase (ALT) concentration was determined from supernatant via manufacture instructions (Cayman Chemical, Ann Arbor, MI)”. “Plasma alanine aminotransferase concentration was higher in SAT compared with CON and PUFA”. Plasma???? No. The methods clearly state that it was liver homogenate supernatant! Plasma ALT is an absolutely routine, standard, everyday marker of liver damage. It is a surrogate for hepatocellular damage, i.e. a normal component of liver cytoplasm which has leaked in to plasma in response to liver injury. It’s measured every day in any patient undergoing any sort of health/illness monitoring blood work. It is a COMPLETELY normal cytoplasm component while it is contained within the liver hepatocytes. It is LEAKAGE to the blood stream that we are interested in as a surrogate for hepatic damage. The rats all had terminal blood samples taken. The group could have measured ALT for a few pence in real plasma from this blood. They didn’t. They homogenised liver and measured ALT in the supernatant. They described this as “plasma”. 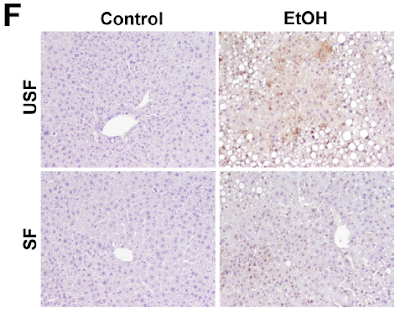 All we can say from Fig 4 is that the liver of stearic acid fed rats has more of ALT within its hepatocytes. ALT is a normal enzyme used for interconverting certain components of the TCA/amino acid metabolism. Who knows why it is increased under stearate feeding, but it's not a marker of hepatocellular damage unless it is being released in to the blood stream... I think we can assume plasma ALT was completely normal. I'd be willing to bet it was measured in a pilot study and failed to pass the pay-dirt test. The related studies cited in this paper are equally interesting and say nothing about much other than the ingenuity of the researchers. As always, my fascination is about the mindset involved. Who decided to homogenise liver to get “plasma” ALT? Who decided to bin the histology friendly liver samples? DLS posted a link to this paper in the comments on the last post. It's really fascinating. It's rather the flip side to the rodent study in the post itself. They took reasonably healthy humans and over-fed them muffins based on palm oil or sunflower oil. "The fate of SFA [saturated fat] appears to be ectopic and general fat accumulation, whereas PUFA instead promotes lean tissue in healthy subjects. 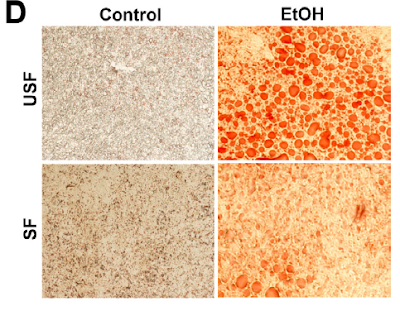 Given a detrimental role of liver fat and visceral fat in diabetes, the potential of early prevention of ectopic fat and hepatic steatosis by replacing some SFA with PUFA in the diet should be further investigated". "the MRI assessment showed that the SFA group gained more liver fat, total fat, and visceral fat, but less lean tissue compared with subjects in PUFA group (Table 2)". Well. I guess we can all just pack up and go home right now. But, ultimately, you have to try to understand what is going on. So let's have a think about it. We have two populations of adipocytes in the two study groups. Each is being provided with an excess of fatty acids to store under the influence of insulin. One population is being exposed to palmitic acid. Palmitic acid provides the maximum FADH2 of all FFAs excepting stearic acid. So it predisposes to generating insulin resistance via reverse electron transport (RET). In adipocytes this means that they are less likely to accumulate triglyceride, ie palmitic acid stops you getting fat. It does this by limiting fat storage under peak insulin. My presumption is that, under free feeding situations, this information about the state of adipocytes is transmitted to the brain, either through plasma fatty acids, hormones or via the autonomic nervous system, resulting in a cessation of eating. But there is no cessation of eating allowed in the study. If you don't gain weight you are made to eat more muffins. You have to eat. If the excess fat in the diet is not going in to the adipocytes it is going to end up somewhere else. Liver and visceral fat are good places if you have nowhere else. Sticking it in muscles might well limit the anabolic action of insulin at this site. The PUFA group are asked to eat more too. The linoleic acid in the muffins allows easy distention of this population of adipocytes (less FADH2 per unit NADH). Insulin acts easily because peak RET is blunted and adipoctes accept more fat. Excess dietary fat ends up in adipocytes, the adipocytes don't care. At 1.6kg weight gain in a young, fit Swede there is insufficient adipocyte distention to raise FFAs in the face of insulin. Eating surplus PUFA appears to be metabolically easier to deal with than eating palmitate beyond acute needs. With sequestration of fatty acids in adipocytes rather than in to muscle we have the possibility for the anabolic effect of insulin actually working at increasing lean muscle mass. We know that the groups were carefully managed to reach a very tightly controlled target of weight gain. Week by week the number of muffins fed per day was adjusted to give us the desired target gain of 1.6kg in each group. It took, on average, 3.1 muffins per day in each group to achieve this over seven weeks. What we don't know is what the pattern of weight gain was during the study. Did the PUFA group gain weight easily in the early weeks and need less and less muffins later in the study to avoid excess weight gain, with the risk of overshooting the 1.6kg target? Did the palmitic acid group show a steady weight gain, almost all of it ending up in ectopic sites because subcutaneous adipocytes didn't want to accept more fat throughout the study? These are interesting thoughts. It is an interesting paper! BTW There are a whole stack more questions regarding the role of fructose in the paper but I think the basics are probably covered in the differential effects of of fatty acids on the electron transport chain. Labels: Saturated fat and fatty liver. Payday in Sweden. The basic conclusion is that feeding rats a high fat diet makes them fat. If it is PUFA based, including a generous amount of omega 3 alpha linolenic acid, it will cook their liver (figuratively speaking... in actuallity it converts their liver to being full of peroxidised PUFA, en-route to cirrhosis). I have an anecdote-type post on the problems of being married to a cardiologist if you happen to be alcohol addicted somewhere. I really ought to dig it out and hit post. 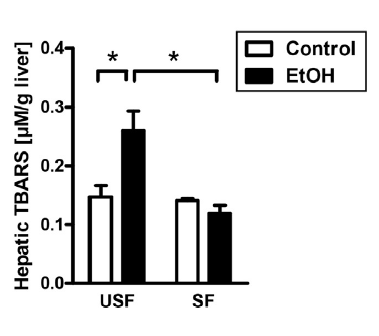 The rats on the PUFA diet, with the gross fatty livers, were less obese than the lard fed rats, had better lean body mass percentage and much better brown adipose tissue hypertrophy and fat oxidation. The paper was not looking at insulin levels or insulin signalling so it doesn't provide the data we need to come to any conclusions but it has resonances to the comment Zoran made on the previous post. PUFA, of a carbon chain length which targets them for mitochondrial oxidation, input less FADH2 at mitochondrial electron transporting flavoprotein dehydrogenase (mtETFdh) than do saturated fats or MUFA. This lack of FADH2 input limits the ability to reduce the CoQ couple and facilitates electron flow down the electron transport chain (ETC) and so limits the generation of reverse electron transport through complex I. This damped RET limits the ROS generation (superoxide and H2O2) necessary to initiate insulin signalling under fasting and to limit excessive insulin signalling in the fed state. So on a whole body basis PUFA maintain insulin sensitivity. Insulin acts, rather well, under PUFA compared to under saturated fat, in the fed state. It works less well in the fasted state. A fed, insulin sensitive animal will do two things of interest on a medium carbohydrate, generous fat diet. It will utilise glucose easily in muscles to burn calories and it will continue to use glucose in adipocytes to esterify FFAs with glycolysis-derived glycerol, to store fat. So the Protons thread expects insulin sensitivity to cause fat accumulation because of maintained insulin sensitivity in adipocytes at high levels of insulin signalling. The cost of this insulin sensitivity is obesity. PUFA = obesity, soybean oil is the best, they used safflower here. Slight aside: The insulin resistance associated with obesity is nothing to do with insulin per se. It is triggered by the fact that very large adipocytes leak free fatty acids irrespective of insulin levels. At elevated FFA levels more insulin is needed to translocate GLUT4s than at low FFA levels. The lard fed rats are the most obese. The PUFA fed rats the least obese. The lard fed rats are on about 10% of their calories as PUFA in their diet. They are probably almost as fat as a 10% PUFA diet would like them to be, ie their adipocytes are almost as distended as a 10% PUFA diet dictates. The rats are almost as fat as they need to be. They are doing this on 380kJ per day. Because the rats are only allowed a total of 380kJ of energy per day. Did you pick that up in the methods? The PUFA fed rats want to be truely, grossly obese, much more so than the lard fed rats do, because they are on somewhere between 50% and 60% of their energy intake as PUFA. But there, in the hopper, is that same old 380kJ per rat per day. It doesn't matter how much your adipocytes are crying out for more fat, how empty they feel, how hungry they tell your brain to feel. There, in the hopper, is 380kJ. These rats are intensely insulin sensitive because their adipocytes are "empty" compared to how thery would like to be. They are "starving" compared to how they would like to be. Their muscles respond to insulin's anabolic effect and I'd be willing to bet their growth hormone levels are through the roof and IGF-1 through the floor (another post there, GH, IGF-1 and starvation). Insulin is going to be low because any glucose released from the liver is easily utilised in the fed state. In the fasting state insulin fails to act effectively so that, while FFAs may be the same as in the lard fed rats, we know (from Figure 2) that lipids are being oxidised much more rapidly on a 24h basis. PUFA sensitise adipocytes to insulin. Given the choice the animal will eat until obese and become insulin resistant due to adipocyte distension. Combine PUFA with starvation and insulin sensitivity will be maintained. Or enhanced. Just the Protons view. Any other explanations welcome. Of course people should ask how the action of PUFA compares to the action of metformin. They are superficially similar. That might need more doodles I'm afraid!